So, I've finally gotten my hands on the Samsung Omnia II mobile phone, the follow up to my favorite Samsung Omnia. 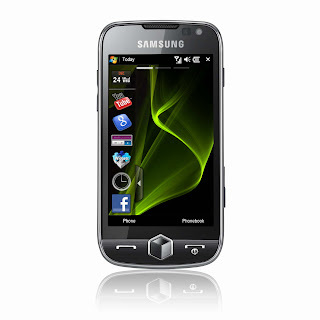 So, is the Samsung Omnia 2 aka Samsung i8000 every bit as great of a mobile phone as its predecessor? Let's find out. Oh, by the way, pardon the crappy pictures. That is the reason why I prefer posting the press photos of mobile phones I've reviewed instead of my own because I cannot take decent pictures to save my life. If you have the Samsung Jet, or if you've read my review of the Samsung Jet mobile phone, then there's really not much to say about the design. 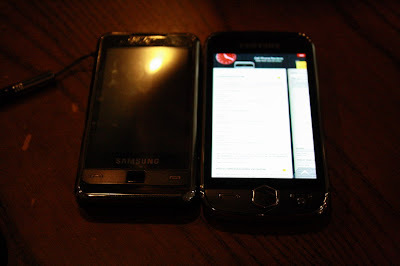 Physically, the Samsung Omnia II and the Samsung Jet sports the same physical appearance though the former has a bigger screen size at 3.7 inches. Samsung dissed the optical mouse button for a center menu button and the call and end button flanks the menu button on either side. You can find the volume control on the left side, there's a 3.5mm headset jack on top, the camera button on the other side, and the dedicated “cube” button on top of the camera button. I'm personally glad that Samsung decided to finally put an on board 3.5mm headset jack on their newer mobile phones. The Samsung Omnia 2 is made up of shiny black plastic, even the battery cover, so expect your whole mobile phone is a finger magnet. 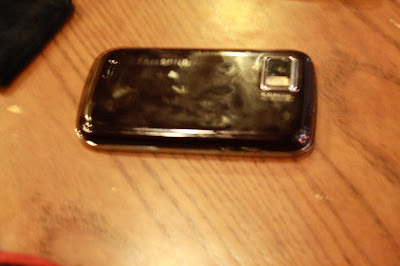 I would have preferred that Samsung retained the non-shiny battery cover of the i900. The MicroSD slot can be found by taking out the battery cover of the phone. Instead of you just conveniently entering your MicroSD card, there's this silver container which you have to pop open. I preferred the MicroSD slot of the Samsung i900 phone. The back of the Samsung i8000 is chuck full of fingerprint smudges. TouchWiz 2.0 is VERY pretty. It did a good job of covering up the old WinMo interface. So, do I like the new interface? I'm a bit torn actually. On one hand, everything is more touch optimized that's why Samsung didn't feel the need to include a stylus, on the other hand, I get a bit lost sometimes. The Samsung Omnia 2 has an 800Mhz processor compared to the 600 MHz of the i900. 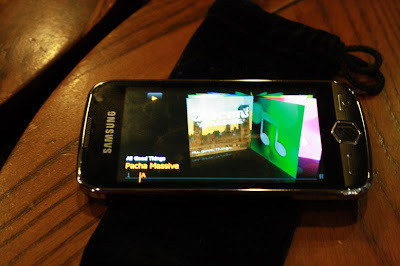 The kinetic scrolling is actually pretty fast, faster than the new generation Samsung Omnias out in the market. On the other hand, I don't know if it's WinMo or Samsung's TouchWiz 2.0 but there's a lag when opening some programs. Also, the screen is not as responsive when tapping to open some programs. I sometimes have to tap programs twice in order to get them to open up. 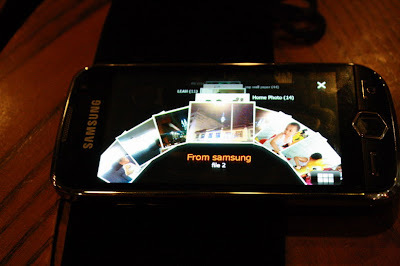 Like the Samsung Jet, the Samsung Omnia II now has three homescreens. The first homescreen has the widget sidebar and some shortcuts at the bottom. The two other homescreens are just different wallpapers and you can customize them by putting in your desired widgets. Now here's my gripe: the three homescreens are pretty useless. First off, when I've already used, say the Memo notepad on one homescreen, I can't use it on the other two, second of all, why would I need three homescreens when everything is already accessible through my sidebar widgets? Samsung would have put the left and right screen swiping by just putting in shortcuts like on the Tocco Ultra: you swipe to the right and the contacts application shows up, to the left and it's the menus. Going back to the covered up WinMo interface, you really have to dig deeper to get into the old UI. Even the start menu is gone. You have to turn off TouchWiz 2.0 in order for you to get your hands on the old WinMo. I have a love-hate relationship with TouchWiz 2.0 on WinMo. I hate TouchWiz 2.0's graphic interface because it's just too—Samsung. It's like I'm handling the Samsung Jet. It's not that I don't like the Samsung Jet, it's just that for novice users, they won't have a way of telling the difference between both mobile phones, it's like it's too “dumb down”. I mean, a windows mobile phone deserves a better UI cover up like what HTC did with the Diamond2. On the other hand, you have to give it to Samsung for making WinMo more user-friendly with their UI. 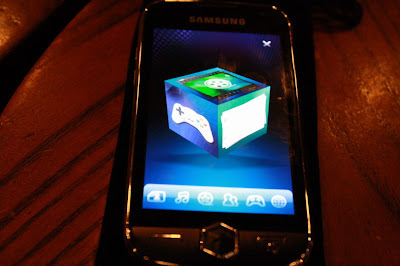 The cube interface is the same with the Samsung Jet. There's also a dedicated button that can bring up the cube interface. I really find no use for the cube except for showing off. Like I said before on my review of the Samsung Jet, if there are already shortcuts to the videos, music, games, pictures applications on the widget sidebar, what would I need the cube for? The Samsung Omnia II's cube interface is similar to that found on the Jet. 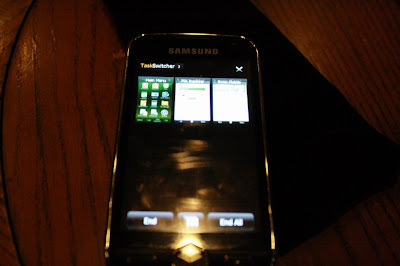 What I like most about the Samsung Omnia 2 is the the Xperia Panels like interface when you bring up the task manager. The shortcut to the task manager is you need to press and hold the menu (center) button. Of course, the difference is that the Xperia Panels or the Palm Pre cards interface shows up your open applications in real time. 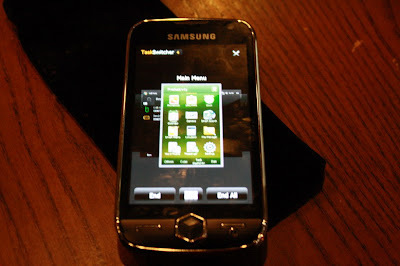 Samsung Omnia II takes a sort of screen shot of your open applications so it's not exactly like the Xperia Panels. 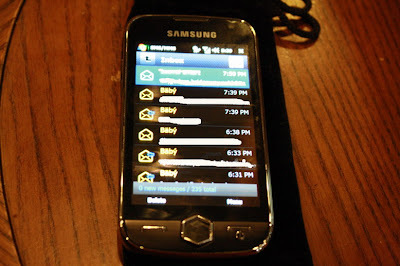 Okay, here's another love-hate about the Samsung Omnia II: the Messaging application. Gone is the threaded messaging that previous Omnia users were used to (if they didn't do the tweak that would remove threaded messaging on their Omnias). You are left with, well, the regular messaging UI found in the Samsung Jet. On one hand, I kinda like it coz I won't have to resort to copy and paste when I want to forward a message to someone, on the other hand, some people prefer threaded messaging in order to keep track of their conversation with someone. The Samsung keyboard also underwent a major change. The keys are now evenly separated and it's easier to type on it compared with the i900. This is because there's a larger screen area for the keyboard. There are also numbers assigned to the upper keys so when you press and hold these keys with numbers, the corresponding number assigned would appear. The Samsung Omnia 2 has large 3.7 inch AMOLED screen. Like every AMOLED phones that Samsung has, the screen produces vibrant images. The Omnia II can play DiVx videos outright and on the sample diVx video that I brought along (CSI episode 356MB file), the phone was able to play it without a hitch and watching videos on it is just great. Audio quality through the speakers is okay, but using headphones or stereo bluetooth and the audio is awesome. Omnia 2's take on cover flow. The picture browser is a bit different. As you can see in the picture, there's an inverted T interface. Your pictures are grouped by folders/albums. Samsung's picture browser is a bit slow rendering the pictures. There's the ever present dice game which can be found on newer firmware of the i900, and of course, solitaire and that bubble game. Amongst Samsung's widgets, I like their notepad application. Like on their Samsung phones, you can now view the actual note you've written and stick it on your homescreen. I love this because it's an awesome app for forgetful persons like me. I'm actually disappointed with the camera. 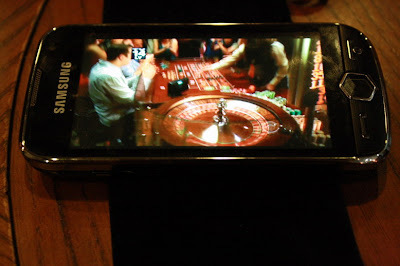 I was hoping Samsung would up the resolution on the Omnia II to 8 megapixels but sadly, it's still 5 megapixels. The camera application is almost the same with the i900 except that you have to tap the screen in order to bring up the camera options menu. I also miss Samsung's optical pad on this phone because with the i900, I just have to press the center optical button and the camera automatically focuses and takes picture. On the Omnia 2, I have to halfway press the camera button to focus and then press again to shoot. For those with shaky hands like me, taking clear photos on the phone would be hard. Picture quality is almost the same as the i900 although pictures taken in low light is very disappointing as there's a lot of picture noise. The GPS application is able to lock in on satellite signals very fast. The Omnia II also has WiFi and the WiFi application is similar to the WiFi application found on the Jet. Using the application, it's very easy to open up the WiFi and connect to WiFi networks. The Web Browser is still the Opera browser. The browser is fast in rendering pages compared with the Opera on my old WinMo. Of course, YouTube on the browser is still non-existent as the streaming player is called up whenever you try to open videos. Battery life lasts two days with normal use, you can probably extend it to three days if you turn off the 3G network and just use 2G. Aside from the other complaints I have had, as I have mentioned, I would have preferred that Samsung retained the optical mouse/directional button as it was quite useful especially if I'm browsing websites and I find it hard to click on some links. 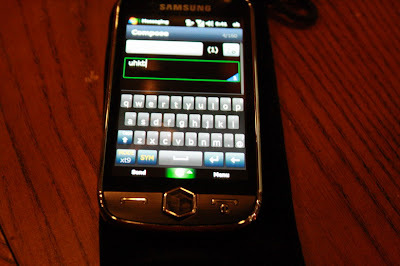 The directional pad would also have made the Samsung Omnia II compatible with previous WinMo applications that made use of directional buttons. Also, I don't know if I just can't find it but when I go to settings and the motion sensor, it seems that I have no way of turning off the auto-rotate function, something which can be done on the i900. This is pretty annoying specially for those who, like me, are really not using their phones in landscape mode. In their next firmware update, Samsung should do something about some of the lags with certain applications such as the picture browser and the messaging application. Maybe they should make sure that the TouchWiz 2.0 takes up lesser resources because I really don't feel the 800MHz processor working. They should also do something about the touchscreen responsiveness since as I've mentioned, some of the applications require me double tapping the screen. The second generation Omnias or i900 seems to be more responsive. I would love to love the Samsung Omnia 2 considering that it's the follow up to my ever beloved Samsung Omnia but I'm a bit disappointed with TouchWiz 2.0. Samsung needs to tweak their UI a bit more so some applications run and open faster. I have no problems with the kinetic scrolling though, it's really fast and responsive. Hardware-wise, I'm only disappointed with the camera, everything else is nice. Maybe once Windows 6.5 or Windows Phone is released, the UI would be better, but till then, I think I'll pass up upgrading my Samsung Omnia i900 with this mobile phone. I'm totally with you. TouchWiz 2.0 has made the Omnia II sluggish. My girlfriend's 2nd gen Omnia performs much better. I hope they get a firmware update soon. I'm debating whether I should get this in eBay but I don't know how much I would pay for customs charges, etc. Does anybody know? I got mine when I visited Singapore. what application should I use to get back to the old WinMo threaded messaging as I don't like the Samsung's own messaging? I think the Omnia II is really a great improvement from the previous Omnia, even compared to the HTC Touch Diamond II. I did a comprehensive review here with lots of screen shots and highlighting most of the programs that comes bundled in the PDA. I'm trying to find out if the Omnia II is able to do a voice dialing through Bluetooth headset, and if the BT button is able to turn on VD? Unfortunately Omnia I is not able to do it :-( . If You are a driver is very basic and useful function. This phone is the dogs danglies! My Old Omnia was completely pants! It was slow, confusing and stubborn needing to be continually rebooted. The New Omnia 2 is FANTASTIC!!! It works how it was meant to and the user interface is brilliant. As a business user all the old phones (unforgivable) inadequacies have been resolved. In my humble opinion – the second Omnia misses the charm that the first version had. True, the specs are much better, and especially the screen, but the D-Pad is horrible, the plastic cover feels cheap, much of the customized applications are not as usable as in the first version, and the keyboard is not even close to the iPhone or Android virtual keyboards. I used to be a big fan of the first Samsung Omnia very much, but I don’t see myself upgrade to the new version. @Gil. Totally agree. But I made a mistake and bought the OmniaPro B7610 instead which is exactly the same but is a bit more bulky. It's TouchWiz 2.0's fault. It took the fun out of the Omnia.